With full of romance in the air, the Dona Paula beach is quite bustling with plenty of activities round the year. 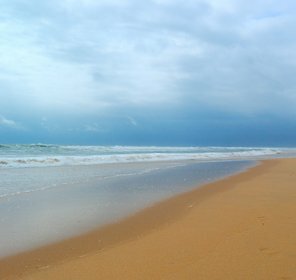 Located 7 kms away from the Panaji, this beach has become one of the most happening beaches of the Goa. 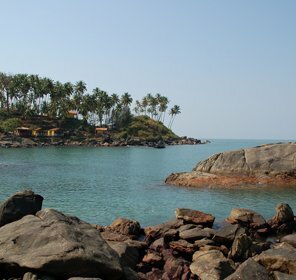 It is snuggled on the southern part of the rocky headland where the Mandovi and the Zuari rivers meet the Arabian Sea. 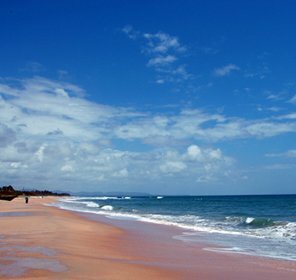 The beach is very popular as lovers paradise because of a myth attached to this place. As per the legend, Viceroy's daughter Dona Paula de Menezes jumped off the cliff after facing objections from her family due to her love affair with a son of a fisherman. So, the beach is popular by the name of Dona Paula. 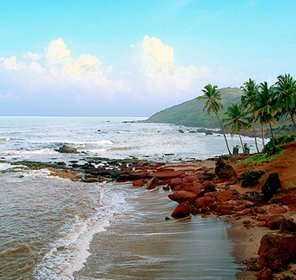 It's a lover's paradise that offers a splendid view of the Mormugao harbor and fringed by casuarinas woods & palm trees. Relish the wonderful view from above the hillock and relax in benches along with taking pleasure of the evening sea breeze and sunset. 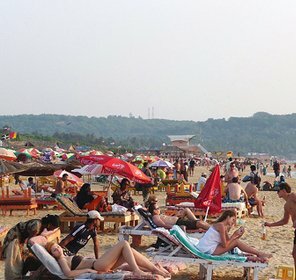 This place attracts its tourists who come to wonder at its natural beauty, pristine beach and the romantic legend connected with it. 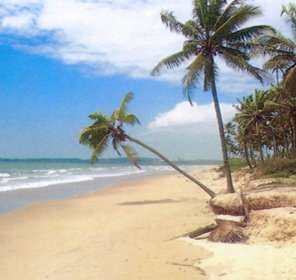 The dainty coastline of the beach is long stretches of silver white sand that has superb view of the beachfront. 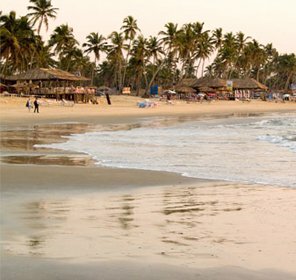 If you want to choose some local knick-knacks, wander to the beachside stalls that offer excellent ranges of straw hats, handkerchiefs, feni, port wine, etc. Other than this, there are also some seafood restaurants near the beach where you can have your lunch and relax after a day of sunbathing. In short, the beach is a mix and match of adventurous water sports, romance and sparkling nightlife. 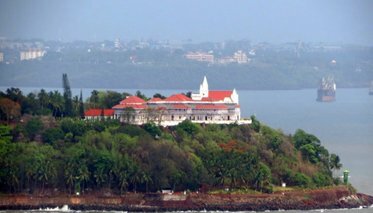 Accommodation at Dona Paula is easily available in all ranges. Right from luxury resorts, deluxe hotels to the standard ones, all kinds of lodges are available to make your stay comfortable. There are a number of hotels and resorts that are well maintained with all kinds of modern amenities. 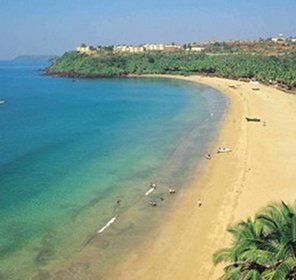 Calm and blue, Dona Paula is the most happening beaches of Goa that unravels its secrecy in water sports and fun. 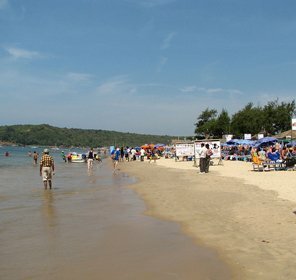 There are many things to do at the beach like sunbathing, adventure sports, sightseeing, etc. 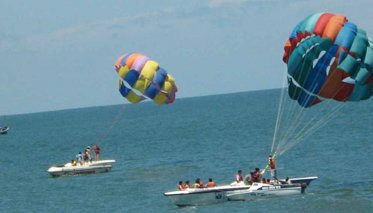 This beach is widely known for offering plenty of water sports activities. For the one who like adventure or wanna do some daring activities, must go for windsurfing, water-skiing, parasailing, windsurfing, water-skiing, parasailing, snorkeling, ski-bob, kayaking, yachting, swimming, sport fishing, toboggan ski-biscuit, and harpoon fishing. In fact, there are many sports club located in Dona Paula that provide in-house and beachside water sports for beach lovers. 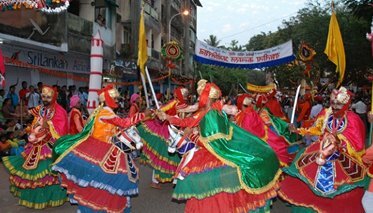 The most famous festival called Janmashtami and the Feast of St. Lawrence are the two main festivals held every year at the Dona Paula beach. During the festive season, the colorful water sports festival will simply draw your attention. Apart from these, you can also be a part of exciting events such as cycle races, water scooter, and surfing. 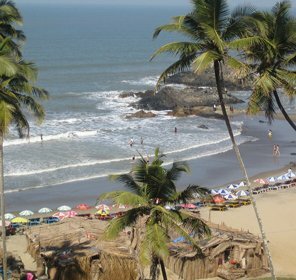 Apart from all the above activities, one can also go for shopping at the Dona Paula beach, where a number of shops are available offering various items like trinkets, clothes, handicrafts, and many more at reasonable prices. On the beach, you'll find some vendors selling spices, straw hats, etc. You can also try Goan liquor specialties Feni, port wine and the local liquor too. 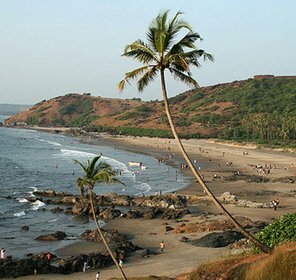 Dona Paula Beach is snuggled on the southern side of the rocky hammer-shaped headlands which divide the Zuari and Mandovi waters. One can experience a beautiful view of the Mormugao harbor. 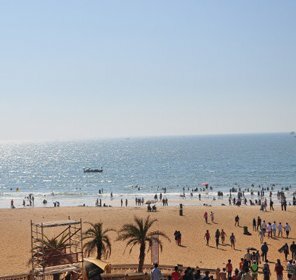 This beach is surrounded by many places of interest which make the sightseeing tour superb. 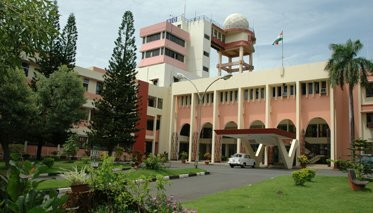 This institute not only deals with the marine biology, but also integrates all the main branches of coastal and marine oceanography. There are two centers of attractions in this institute comprising the Marine Biology Museum and Taxonomy Reference Centre that draws a large number of travel explorers from all over the world. This Niwas is just half a kilometer away from the National Oceanography Institute, which houses the tomb of Dona Paula de Menzes in the Cabo Chapel. 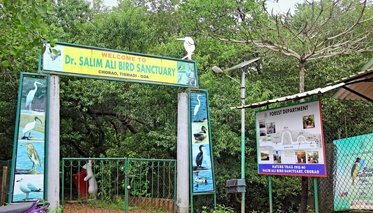 Situated 9 km away on the western tip of Choro Island, along the Mandovi River, this Sanctuary is a mangrove forest where you can find a huge variety of domestic and migratory birds in their habitat. 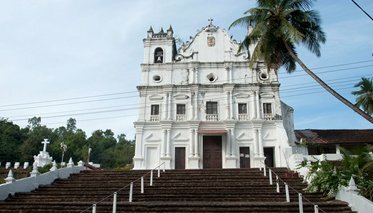 At the distance of 10 km from the Dona Paula, there is one of the oldest yet fascinating Church dedicated to three Magi-Melchio, Gaspar and Balthazar. The nightlife at Dona Paula is very entertaining and filled with pleasure. For hippie nightlife, Tito's at the Baga beach is the best option as it remains open till the wee hours. There are some popular pubs and bars where one can hang out and enjoy the sparkling nightlife of the beach. The Dabolim Airport is the nearest one that is at the distance of 32 km from the Dona Paula. One can easily reach here from any major cities of India like Mumbai, Chennai, Pune, Delhi, Kolkata, etc. From the airport, one can reach the destination by bus or car. The nearest railhead is Karmali Railway Station, which is at the distance of 14 km. Other nearest railheads are Margao and Vasco Da Gama. 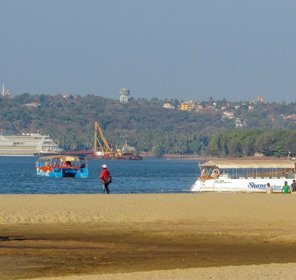 Panaji is the nearest bus station, which is located just 6 km away from Dona Paula beach. Goa state government bus services like Kadamba Transport Corporation (KTC) and other private buses are always available from Panaji. 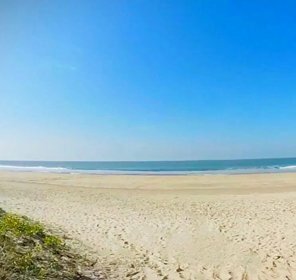 November to May, If you want to rejuvenate yourself from the hustle and bustle of your city or looking for romantic getaway, head towards the beautiful Dona Paula beach. With the romance and mythos, many travel junkies crowd this beach not only to view the deceased lovers, but also to pamper themselves in the pleasant ambience. 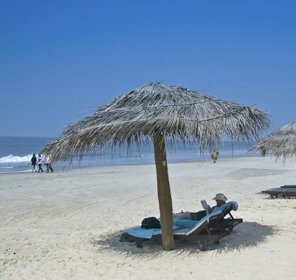 So, book your best holiday packages from Tour My India and relish your trip with full pleasure.